Author and actor Maurice Kamhi paints a poignant portrait of the horrors of war and the complexities of love in this epic saga. This staid existence changes when the Bosnian War breaks out in 1992. His beloved uncle Albert and aunt Zuza are still in the country. After he loses telephone contact with them, our hero makes a risky decision—to travel to Sarajevo and rescue them himself. He hires a husband-and-wife team of Croatians as guides and is soon irresistibly attracted to the woman, even in the midst of danger and disaster. 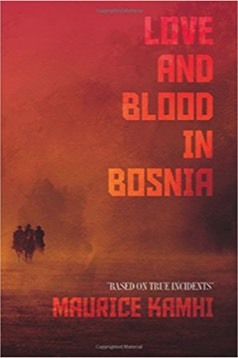 As he journeys through the former Yugoslavia, the protagonist witnesses the horrors of war firsthand. He also learns about his uncle’s adventures in World War II, which he chronicles along with his own present-day exploits. Along the way, he discovers that heroic quests aren’t always as simple as they appear. We are offering you an opportunity to secure your personal copy of Maurice Kamhi’s exceptional book today. Please click here to secure your copy of the book.